Educational experts agree that quality teaching is the single most important factor in improving educational outcomes for all students. Teaching is a highly sophisticated and complex endeavor requiring deep expertise on the part of teachers and school leaders. This book shows how teacher, school, and district leaders can cultivate the expertise of teachers to deliver high quality instruction for all students. Leading for Instructional Improvement captures the nationally acclaimed work conducted by the Center for Educational Leadership at the University of Washington in its effort to improve the quality of teaching and leadership in schools across the country. The book provides extensive practical guidance grounded in theory and research, along with powerful stories and examples from classrooms, schools, and districts. Many of the tools, protocols, and frameworks contained in this book can be accessed electronically by visiting the Center for Educational Leadership website at www.k-12leadership.org. "This book offers insights that are invaluable to educators who seek to enhance teacher effectiveness now. The ideas presented are practical and applicable to schools in a variety of settings." "A deep and thoughtful look at how the issue of expertise is cultivated. 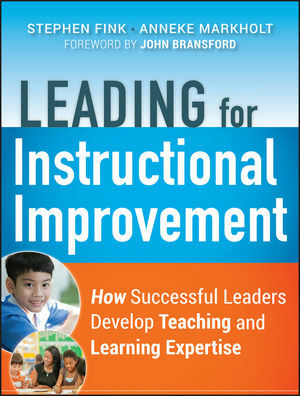 Seizing upon their Center's research-based instructional framework, the authors provide important insights and tools." "In this age of intense focus on how we evaluate teachers, we have to remember that any evaluation is only as good as the evaluator. This extremely useful book provides an excellent roadmap for how principals can become more effective in the most important aspect of their work, instructional leadership." "Fink and Markholt offer practitioners a guide to effective teaching. Leading for Instructional Improvement asks us to heed the lessons within and support the kind of teacher education that will improve student achievement for today's schools and those of tomorrow." Stephen Finkis executive director of the Center for Educational Leadership and affiliate associate professor in the College of Education at the University of Washington, Seattle. Anneke Markholt is associate director of the Center for Educational Leadership and an affiliate faculty member at the University of Washington in the department of Educational Leadership and Policy Studies.